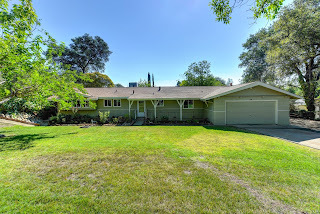 4514 Martsmith Way - Here is your opportunity to own this beautifully private, gated single story 3bd/2ba ranch home on 1.23 acres in heart of Fair Oaks with horse property potential! Newly renovated throughout with new windows, flooring, updated kitchen and baths - move in ready! Large, open floorplan with great layout. Living/ dining room opens to family room with stone fireplace. Eat-in-kitchen with granite counters, tile backsplash & new appliances. Lots of storage space, full 2 car garage, front porch and back covered patio. Relax/ entertain in the large back yard, enjoy picking fruit from the trees or keep a couple of horses on the fully irrigated back pasture!